Brian Grace, director of communications at Progressive Insurance, runs down how the lakeside city is gearing up for big events like the 2016 Republican National Convention. This year’s Republican National Convention in Cleveland is set to be one of the most high profile in history, with the presence of controversial frontrunner Donald Trump focusing even more global attention on the race to find a candidate to take on Hillary Clinton or Bernie Sanders in the presidential election. For four days in July, Republican Party heavyweights will borrow King James’ domain to nominate their contender for the White House, and they’ll find a city ready for the spotlight. "It’s all about energy and an opportunity to tell Cleveland’s story," says Brian Grace, director of communications at Progressive Insurance. "It’s Cleveland’s opportunity to be on the world stage." But Cleveland’s residents aren’t waiting around for the Republican convention to get under way. Grace explains that he, along with other local communications executives and people coming together in the city, have essentially created a "volunteer army dedicated to the cause, to taking advantage of the international spotlight, and showing off what’s happening to Cleveland." There’s been "an amazing resurgence" in the city bordering Lake Erie, whether it’s the launch of a restaurant or hotel, or a new park opening, says Grace. Add to that organizations known the world over, such as Cleveland Clinic, the Cleveland Orchestra, and Cleveland Cavaliers, which Grace says adds to the allure for the always-coveted millennial generation. In the communications space, Grace says "ample opportunities" exist for junior- and mid-level professionals, given the amount of brands and in-house openings at corporations. Increased competition at higher levels tracks with the industry trend. "It’s a sheer numbers game," Grace explains. Apart from Progressive, six other companies in the Cleveland area landed on the Fortune 500 list last year, according to Cleveland.com – Goodyear Tire & Rubber, FirstEnergy, Parker Hannifin, Sherwin-Williams, TravelCenters of America, and J.M. Smucker. Progressive’s recruiting efforts cross all levels of experience and seniority, says Grace, and the city offers a draw others cannot boast – including the fact that it’s "stunning how far your dollar goes here." The mind behind the company’s recently released recruiting video previously worked in Chicago before being won over by Cleveland. Local universities add to the draw of staying local, says Grace, who adds that his colleagues have as their Alma maters the likes of Case Western Reserve, Kent State, Ohio State, and John Carroll University. "The cool thing is, once people find out about what Cleveland has to offer, the city sells itself," adds Grace. Meanwhile, being nestled between hubs such as New York and Chicago allows for "great collaboration and quick travel opportunities" between cities. As for his favorite part of his hometown, Grace can’t name just one, but says it’s between "the parks, the dining and the cultural institutions." "In a given weekend, my family takes advantage of all of those," he adds. 1. Cleveland is also home to the Rock and Roll Hall of Fame, which will induct Cheap Trick, Chicago, Deep Purple, N.W.A. and Steve Miller in 2016, according to its website. 2. The Columbus Dispatch reported in December that Cleveland saw its unemployment fall to 3.7% in November, a number it hadn’t seen in nearly 15 years. 4. Local chef Jonathon Sawyer took home the James Beard Foundation Award for Best Chef Great Lakes last year, according to Cleveland.com. 5. 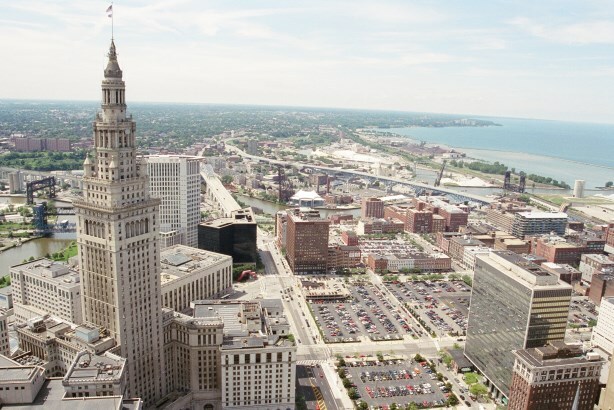 Cleveland’s top industries include healthcare, bioscience and technology, according to Forbes.